A collage post highlighting Modi government’s success was first shared by Facebook page Nation with NaMo. BJP Karnataka shared the same. 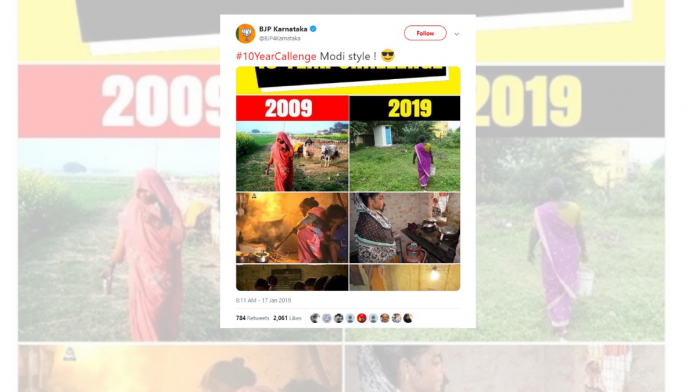 New Delhi: As the #10YearChallenge takes off on social media, Bharatiya Janata Party (BJP)’s Karnataka wing joined the bandwagon Friday to boast Prime Minister Narendra Modi-led government’s policy success. Ironically, the party has used images up to 8 years old to highlight development in 2019. The trending social media challenge requires users to post a photo of themselves from 10 years ago, contrasting it with their present appearance. The collage post was originally shared Thursday by Facebook page Nation with NaMo. It has over 5.2 thousand likes and nearly half as many shares. On Friday, BJP Karnataka followed suit and tweeted the same collage. The six images in three sets in the collage seek to demonstrate the success of the BJP’s flagship policies such as Swachh Bharat Mission, Ujjwala Yojana and the Saubhagya scheme, “Modi style”. Through the images, the tweet seeks to compare the situation in 2009 under the United Progressive Alliance (UPA) government with present-day under the Modi government. In the first set, the left image shows a woman walking with a pail of water in her hand, presumably to defecate in the open. The parallel image on the right shows a woman heading towards a toilet — the mainstay of the Swachh Bharat Mission seeking to make India open-defecation free. The image used to demonstrate the success of the mission is around eight years old. 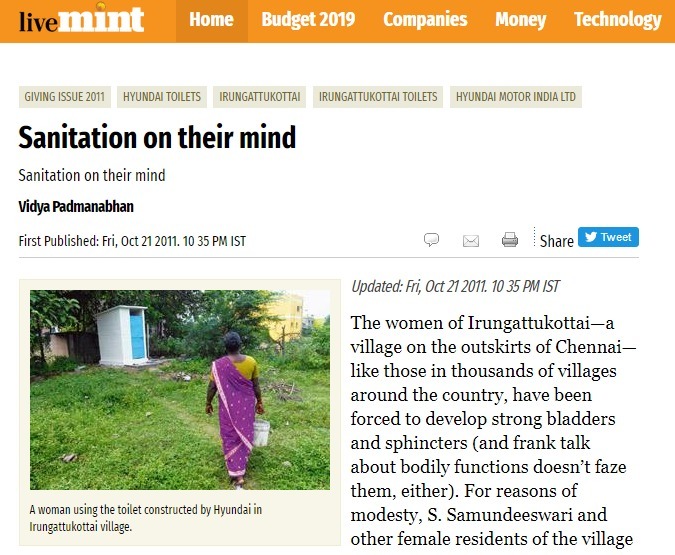 A 2011 report published on Livemint carries the same image with the caption, “A woman using the toilet constructed by Hyundai in Irungattukottai village”. In the second set, the left image shows a woman struggling to cook with fire fumes surrounding her. The image on the right shows her work easing with the introduction of an LPG cylinder. The point here is to illustrate the success of the Ujjwala scheme. Just like the previous instance, the second image is from an older published report by Down To Earth, debunking claims that Ujjwala was making cooking gas accessible to all. The third set, to highlight BJP’s success in electrifying rural India, uses the image of a little boy studying in the light of a bulb, as opposed to the earlier gasoline lamp. However, yet again, the second image in the set is at least a year old, published by Livemint in 2018 with a report analysing the National Family and Health Survey. Wanting to be part of the challenge, the BJP has, perhaps, revealed more about the success of Modi government’s success than it would like to.